The rebel group known as the Silver Ravens once fought for independence in the city of Kintargo, but after the Chelish Civil War came to an end, they disbanded—until today! Now, new heroes have reestablished the organization to stand against the inquisitor Barzillai Thrune and his oppressive diabolic regime. But before the Silver Ravens can rise up, they need allies—friends among powerful groups like the Order of the Torrent Hellknights, a hidden cult of Milani, and disenfranchised agents of the government itself. But until the heroes find the ideal hideout for their rebellion—a place secret enough and strong enough to withstand the battles to come—they'll be forced to stay in the shadows. When a perfect site for their headquarters comes along, will the heroes survive long enough to claim it as their own? 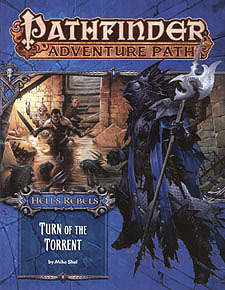 "Turn of the Torrent," a Pathfinder adventure for 4th-level characters, by Mike Shel. A look into the ecology and society of the sinister aquatic humanoids known as skum, by Thurston Hillman. Danger in a den of thieves in the Pathfinder's Journal, by Stephanie Lorée. A collection of devious and dangerous monsters by Tim Nightengale, Mike Shel, and Todd Stewart.